We have made it through the annus horribilis of 2016. It saw more celebrity deaths than any year I can remember, including Prince and David Bowie at the top of the celebrity list. Not to mention a truly tumultuous presidential election here in the US. (Regardless of how you feel about the President Elect, it's impossible not to notice the rift between our people. It reminds me of the Civil War, where brothers were on opposing sides and families were torn apart. My own family has been torn by this election.) Also, the UK decided, for some reason that nobody seems to know, to leave the European Union in a political move called Brexit. On a more personal level, people close to me struggled in ways I didn't realize until things blew up in all of our faces. I have (had) been making it a point to write more. I decided that I could sit around waiting for the right time to write, waiting for my novel to fall out of the sky into my outstretched hand, but so far that hadn't been terribly successful for me. So, I began to write. I wrote on my blog, and I wrote on a novel. I began to follow a few bloggers as well. One blog in particular spoke to me about the current opportunities we have as writers. Kristen Lamb wrote a book about writing in the digital/social media age and the way people can take control of their own brand. I began to read her book and put into practice what she was preaching. Then, I noticed that I was slacking at my day job. It's a tough balance. I also noticed that in order to be successful at my day job I needed to focus more and more time on that job - not only when I was in the office, but checking in in the evenings and weekends as well. I came to the conclusion that it would not be possible to pursue both this job and my new personal goal of building a brand and writing a novel. I try not to talk bad about this employer because they were good to me for nine years. I changed; they did not. I could have gone forward with enthusiasm and I could have moved up with the company and made a name for myself. But, I didn't really want to. I found myself in the position of working half-heartedly and I realized that I would soon become bitter. I don't want to be the negative influence in the office. So, I took a chance and applied for other jobs. I interviewed and finally found one, and it promises to be secure and to have set hours. I gave notice at my employer and yesterday I worked my last day. This came as a shock to many people there, and frankly it was a shock to me. I haven't entirely accepted the fact that I am no longer working there, that those problems are no longer my problems. I don't think I was cut out for that sort of work in the first place. I told my manager that the main reason I was leaving was that I wanted a job in which I didn't have to medicate myself in order to get through a day. (It's true. Those meds turn you into a zombie and there is no creativity in the evenings.) If you get down to it, I think I was born to be a trust fund baby - to have funds to support myself without having to work and then be able to pursue the creative interests at my leisure. Or, at the very least to have a little financial support while I pursued them. Alas, I learned this about myself too late in life and I squandered away my youth working since I was 15 years old. So, here I am on the first day after my previous job, the first of five days off until my next job begins. I should have cleaned my room entirely, done all of the laundry, cooked lunch and dinner and written a blog entry and 1,600 words in my novel. I didn't. I washed two towels that my cat puked on and ate lunch at a local cafe with Barry. I am now writing the blog entry and tonight I will look at the novel situation and assess where to begin again. In the meantime, I leave you with the picture at the beginning of this entry - an example of serendipity that I hope is a portent of good things to come this year. 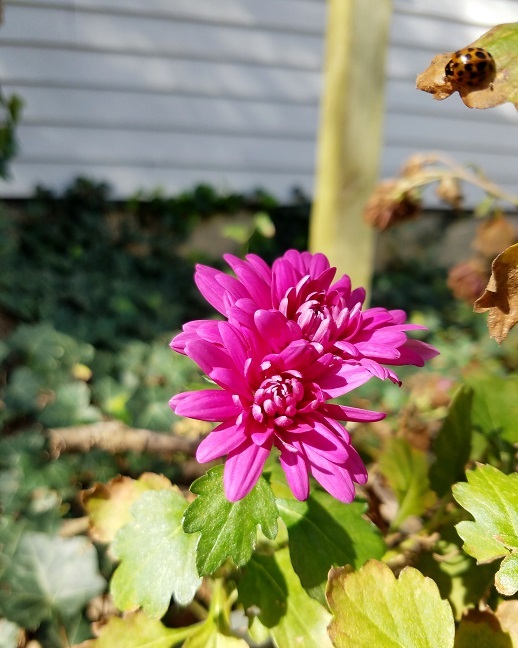 I was taking pictures of a chrysanthemum that bloomed this winter, and I captured a ladybug as well, which I didn't realize until at least a day later when I was looking through my pictures. It's going to be a good year.